Lea spends her time writing, reading and working. She is both a stay at home mom and a "work from home" professional. Her knight in shining armor is not only her husband but also her best friend. Her heathen children are the entertainment that keeps her going. The stories that tumble from her fingers are definitely a combination of her fascination with science and the emotional aspect of romantic encounters. Alpha males top my hero list. I love writing hard-nosed, intelligent, difficult males. They have to be confident, masculine and (eventually) devoted. I want my heroines swept off their feet by the big, burly, scary male. Well, unless the heroine is strong, then the males tend to just be their equals. People ask me all the time why I write paranormal and shifter books. The easy answer is: I write what I read. I love paranormal, science fiction, suspense… anything that can grab my attention and keep it. But that is the easy answer. The more involved answer lies in my adventures throughout my teen years and the subsequent things I’ve experienced as an adult. When I was in high school a man, who was involved in environmental education and animal rescue, approached the science teachers. He asked for students that would be willing to work with animals and do grunt work around his compound. My then boyfriend, now husband, and I jumped at the chance. Our first job, and something we did for the three years we were involved with the organization, was butchering roadkill to feed to the animals. Now, for those squeamish folks reading this I won’t go into details, but let me just tell you that there are things I saw and smelled that I will NEVER forget. You can ask me, because most people do, WHY stay working for someone if all you are doing is cutting up dead things?! I’ll tell you why in two words: wolves and cougars. He not only had predatory birds like hawks and eagles, he had two rescued cougars. Shortly after we started working for him, he acquired a pair of female wolves. They were pups when they were first brought to his compound. 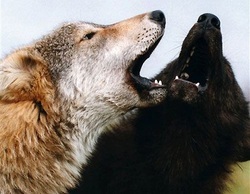 We were two of the first humans introduced as pack. Let me tell you, if you have never experienced the power and absolute majestic qualities of wolves you are surely missing something. Even as pups they were strong and dominant. We were constantly being challenged. It was awesome.